LANDHAUS MAYER has recently established a cooperation with the winegrowers of Lower Austria, who have been passionately dedicated to cultivating their prime vineyards for generations. Gerhard J. Lobner, production manager of Landhaus Mayer, and the winegrowers jointly decide which steps to take in the vineyards. The vines are closely monitored from the pruning up to the optimal harvest time. "I cannot even begin to describe the potential of these areas", Gerhard J. Lobner enthusiastically says. Due to structural change, many of the prime vineyards are highly endangered of being abandoned. 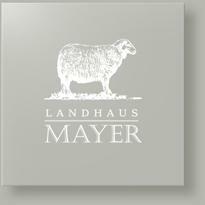 Landhaus Mayer wants to take countermeasures and develop promising prospects with the local winegrowers. Wine Enthusiast 90 "Citric force creates a pleasant vortex of green pear on this easy, zippy and full-fruited summer wine. Finishes with a lip-smacking fillip of bracing, lemony freshness. Almost like sherbet." Wine & Spirits 87 "Best Buy""Limey and Fresh, this is an easy summer pour with a gentle, chalky richness."